As much as we may want to, most of us don’t have the time to become a carpenter’s apprentice, nor the money to go to the North Bennet Street School. Fortunately there are other ways to pick up some basic home improvement and DIY know-how. 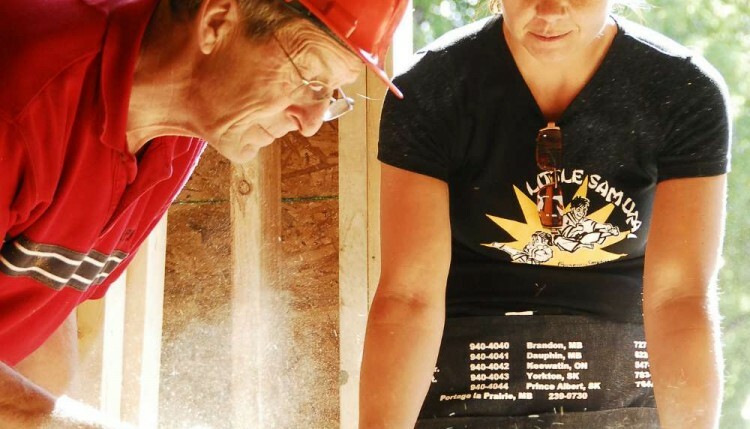 I recently wrote an article for the Boston Globe about a couple of volunteer programs — like Habitat for Humanity — where, in addition to helping the world, participants get to learn some useful home improvement skills, from installing windows to laying tile. In exchange for your time and energy, you can learn real-deal construction techniques from industry pros and put them into practice on a construction site. The best part about those programs is that you’re not just improving your own home — you’re improving the world around you. The nation’s biggest home improvement chain offers a ton of free workshops at many of its locations — usually once a week on Saturdays. Upcoming classes run the gamut from replacing a kitchen or bathroom faucet to drywall repair to installing a toilet to basic electrical skills. There are also monthly kids’ workshops, and a “Do It Herself” series exclusively for women — the next one, on Aug. 20th, is how to build a shelf and finish it with crown molding. Fancy! Volunteering with Habitat about a decade ago was my first introduction to anything home-improvement related. I was put to work on a Dorchester rehab project, and I was blown away when we were told to just rip down the old plaster walls with crowbars. If it hadn’t been for that experience, I would have been terrified when it came time to tear up our own kitchen a few years ago. The next day on the site, I got to lay tile in an entryway, which I really enjoyed. Tiling is actually a very simple, cost-effective DIY project — if you have some guidance the first time. The site supervisor, a professional contractor, set me up so I knew what I was doing and checked in on my progress periodically. It was really empowering. Of course, the amazing thing about Habitat isn’t just learning these useful skills you can use to fix up your own house — though that is a nice side benefit. No, it’s helping to build a real home for a local, low-income family who has often gone through great lengths to qualify for the program, and may be working hard right alongside you on the construction site. “A lot of people have the mis-impression that Habitat gives homes away. We absolutely do not,” Habitat Boston CEO Lark Jurev Palermo told me. In fact, Habitat “homesteaders” are required to put in 300 hours of volunteer work. They then purchase their home using a 0% mortgage through Habitat. Habitat of Greater Boston has three active construction sites; visit Habitat.org to find other nearby chapters or to check out international volunteer opportunities (definitely not free). This unique, awesome resource in Roxbury Crossing deserves its own entire post, and rest assured I’m working on it. For now, just know that the BBRC — in addition to selling donated building materials at a discount, helping you save money and the environment at the same time — offers a number of helpful one-day workshops on everything from installing a door to kitchen design to tiling. I took the tiling workshop several years ago to brush up on what I’d learned through Habitat, and it helped me make quick and painless work of our kitchen backsplash. And then another one a couple years later. Well worth the $45! Many of the workshops are particularly tailored to Boston-area homeowners, such as “Energy Retrofits for Older Homes,” “Window Rehab” (repairing the pulleys in your ancient windows), or “Water and the Wooden House.” Check out the BBRC’s full schedule of workshops here. Walking through Rockler is like a Home Depot stroll on steroids. There is SO MUCH COOL STUFF. The employees are passionate and knowledgeable about all things woodworking. If you want some completely free know-how, just talk to one of them for awhile. If you don’t mind shelling out a few bucks, you can sign up for classes in everything from router techniques to joinery. Beginner classes at the Cambridge location are $25 for an hour, and advanced classes are $50 for an hour. Rockler is a national chain, so check out the store near you if you’re not in the Boston area. An arts organization in Jamaica Plain, the Eliot School offers an incredible array of in-depth courses spread out over several weeks, including basic woodworking, furniture design, basic home repairs, and advanced carpentry techniques such as dovetail joints. Check out the current class schedule here. This Somerville nonprofit is another good option for longer-term classes in everything from metalsmithing to bike repair to woodworking. Summer 2015 woodworking classes include “Build a Table,” in which, for $200, you’ll learn the ropes on the table saw over four Friday sessions and take home a handmade table to boot. I can still remember when I had to replace a leaky faucet in our tenants’ kitchen, only a few months into owning our two-family. I was laying under their sink while my wife stood next to me with our laptop, streaming a life-saving This Old House video and walking me through the tutorial. Amazingly, it worked. There are plenty of how-to videos and “Instructables” on the Web, but this is always the first place I look when I need to know how to fix or make something. Lowe’s may not offer the in-store workshops that Home Depot does, but they make up for it with an extensive library of how-to videos and tutorials. You’ll find detailed instructions for just about every common DIY project and then some, from installing a ceiling fan to removing a stripped screw to building a platform bed.